1st Hour: 2-minute Power Pitches inside the Power Pitch Theater. 2nd Hour: 60-minute Electronic Poster Presentations at the numbered plasma screens outside the Power Pitch Theater. A multiple degree-of-freedom robotic controlling system was developed to guide the fiber optic targeting lateral hypothalamus in the rat brain inside the high field (14.1T) MRI scanner. 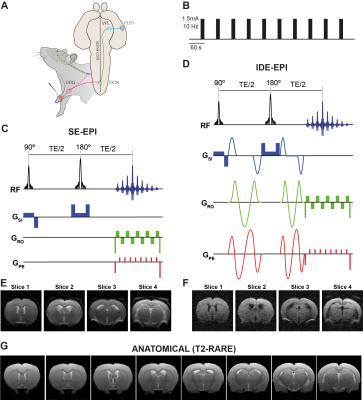 Optogenetic activation of the LH leads to highly reliable functional fMRI activation patterns in the LH and its projecting regions including LPO, MPA, MPOL and StA across animals. The MgRA provides a MR-compatible brain intervention strategy to target deep brain nuclei for optogenetic activation or calcium recordings with high precision and flexibility. 17 Multi-centre resting-state fMRI comparison reveals common functional networks in the mouse brain. Functional imaging studies in rodent have gained considerable momentum over the past years, holding the promise to provide a crucial translational tool to comprehend the functional signatures of the healthy and diseased brain. Mouse resting-state (rs-)fMRI has been adopted by numerous laboratories world-wide, yet, variations in equipment, animal handling and data analysis protocols render the comparison of results between studies difficult. We have carried out a multi-centre comparison comprising 12 mice rs-fMRI datasets analysed through a common pipeline and identified the major resting-state networks expressed across datasets. We provide a detailed investigation into the reproducibility and robustness of the protocols. Hippocampus plays a prominent role in central nervous system functions. It receives convergent projections and sends reciprocal divergent projections, forming an interactive cortico-hippocampal-cortical network. However, the precise brain-wide functional organization of different hippocampal activities along dorsoventral axis remains unknown. Using optogenetic fMRI, we revealed that functional organization of low frequency hippocampal activities along dorsoventral axis exhibits a gradual change from regions mainly involved in cognition and sensory processing to regions also involved in motor control and anxiety-related behavior. Additionally, hippocampal activities generally transit from long-range propagation to downstream cortical/subcortical regions to local intra-hippocampal propagation with increasing frequencies. fMRI is based on the dogma that neuronal activity couples to local hemodynamic changes; however, exceptions to this rule exist with little explanation why. Additional neurophysiological context, such as concurrent release of vasoactive neurotransmitters, is required to discern how other underlying factors contribute to evoked hemodynamic responses. 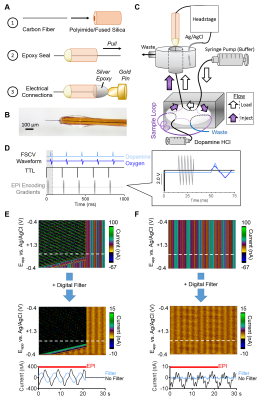 Fast-scan cyclic voltammetry (FSCV) is a minimally-invasive technique capable of detecting neurotransmitters and tissue oxygen with high temporal and spatial resolution. 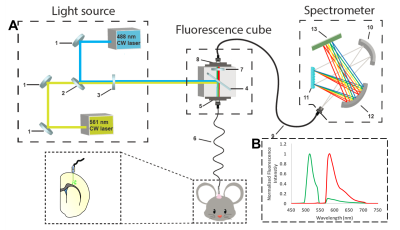 Here, we design a multimodal platform to perform simultaneous fMRI and FSCV, prove its feasibility in vitro, and expand its use to characterize evoked oxygen detection in vivo. The sensory system is topographically organized by highly interconnected excitatory thalamo-cortical and interhemispheric cortical-cortical projections. However, little is known at present regarding the existence of spatiotemporal neural activity pattern(s) that may dictate the propagation of activity between cortices at both hemispheres. Here, we employed a novel paired-pulse optogenetic fMRI stimulation paradigm to reveal a temporally-specific neural activity pattern initiated from the somatosensory thalamus that could drive activity propagation from the ipsilateral to contralateral cortex. We found that propagation from the ipsilateral to contralateral somatosensory cortex was facilitated when paired optogenetic stimulation pulses were spaced at 100ms, but not 50ms. Pharmacological fMRI (phfMRI) is widely utilized to study the effect of specific drugs on brain circuitries and neurotransmitter systems. Some drugs induce elevations in mean arterial blood pressure (MABP) which can increase cerebral blood flow (CBF) and translate into blood oxygenation level-dependent (BOLD) effects. Dynamic autoregulation buffers abrupt changes in MABP to keep CBF relatively constant in a particular range, which was previously defined in rats as 60-120 mmHg and sanguinely applied to mice. 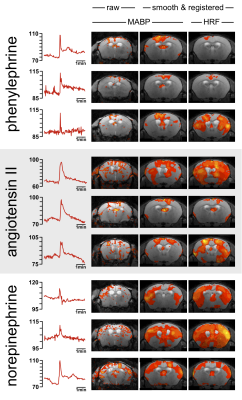 By pharmacologically challenging and monitoring the MABP during fMRI we show that these limits of dynamic autoregulation do not apply to mice. Therefore murine phfMRI studies should be interpreted with caution. Here we present a novel approach to non-invasive neuromodulation that affects neuronal activity by delivering neurotransmitter chemicals to targeted areas of the brain. This is achieved by using focused ultrasound to open the blood-brain barrier in a targeted brain region such that a systemically injected neuroactive chemical will enter into the brain parenchyma only at the intended site. We demonstrate the proof of concept in a rodent model by delivering GABA to the somatosensory cortex to suppress activation from hindpaw stimulation, and by delivering glutamate to the thalamus to enhance activation downstream in the cortex from hindpaw stimulation. 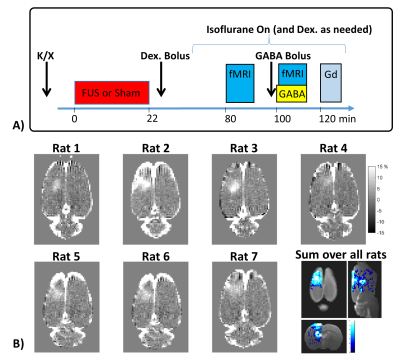 We demonstrate the experimental setup and the use of multispectral fiber-photometry during fMRI in vivo for concurrent measurements of GCaMP6f, CBV, and BOLD. The fluorescent intensity of GCaMP6f and Rhodamine B, a red fluorescent dye which represents CBV, increased during spontaneous motion in the freely moving animal. GCaMP6f, CBV, and BOLD increased when forepaw electric stimulation was given in the simultaneous fMRI and fiber-photometry. 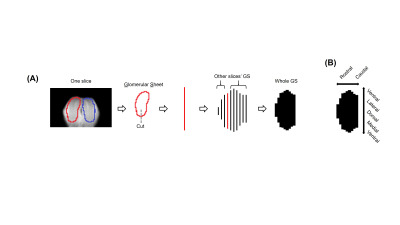 We conclude that simultaneous multispectral fiber-photometry and functional MRI is a powerful tool which has an advantage in both temporal and spatial dimensions. Rhodamine B could be a surrogate CBV indicator in the regions of interest. fMRI offers an excellent opportunity to study neural activations in the central nervous system. In this study, cerebral blood volume (CBV) fMRI with USPIO was used to measure simultaneous odorant and visual stimulation-induced neural activations in mice. 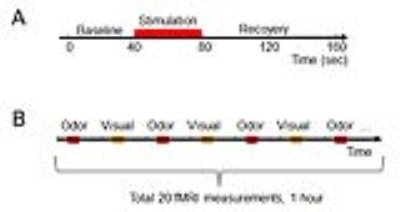 Olfactory responses were observed in the olfactory bulb, anterior olfactory nucleus (AON), and piriform cortex (PC), while visual responses were observed in the lateral geniculate nuclei, visual cortex, and cingulate cortex. The neural phenomenon of “post-inhibition excitation rebound” was observed in the responses in AON and PC, and the fMRI phenomenon of “post-stimulus undershoot” was observed in the visual responses. 25 Distinct structure-function relationships at different hierarchical levels of structural connectivity in the rat brain. The relationship between functional and structural connectivity strength in the brain remains uncertain. We compared high-field resting-state fMRI, diffusion-based tractography and neuronal tracer data to robustly characterize the rat connectome. Our study revealed that strong structural connectivity is not required for strong functional connectivity. We found distinct structure-function relationships at different hierarchical levels in the rat brain: functional connectivity strength correlated moderately with diffusion-based structural connectivity strength, but did not significantly correlate with neuronal tracer-based structural connectivity strength. Hereby we demonstrate the importance of examining or appraising connectivity at different hierarchical levels for reliable assessment of neural network organization. Most preclinical resting-state functional magnetic resonance imaging studies are performed in anesthetized animals, but the confounding effects of anesthesia on the measured functional connectivity (FC) are poorly understood. Therefore, we measured FC under six anesthesia protocols and compared the findings with data obtained from awake rats. 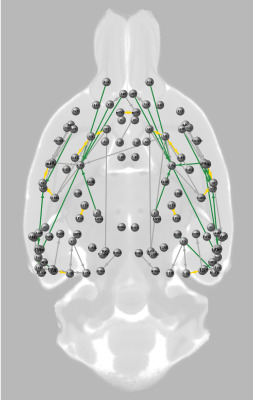 Connectivity patterns obtained under propofol and urethane anesthesia were most similar to that observed in awake rats. 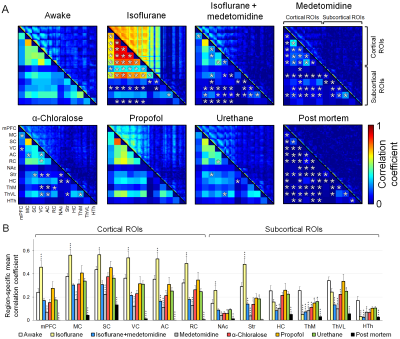 FC patterns in the α-chloralose and isoflurane-medetomidine combination groups had moderate to good correspondence with that in the awake group. The FC patterns in the isoflurane and medetomidine groups differed most from that in the awake rats. The mechanisms behind spontaneous activations in the BOLD signal are not understood. Quasiperiodic patterns are reliably recurring spatiotemporal events that involve spontaneous fluctuations of brain regions. We hypothesize that quasiperiodic patterns are regulated by neuromodulatory inputs from a subcortical driver. Pharmaceutical modulation of the locus coeruleus resulted in reduction of the strength and frequency of quasiperiodic patterns in the BOLD signal. This indicates a direct relationship between the locus coeruleus and quasiperiodic patterns. These findings suggest that spontaneous activity in the brain may be arising from controlled neuromodulatory input, allowing for a clearer understanding of the mechanisms that drive it. 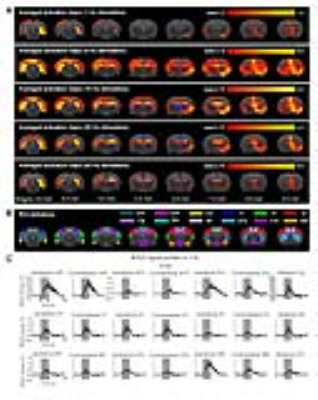 Stimulus-driven and resting-state fMRI BOLD signals have previously been reported in the spinal cord to delineate its functional architecture. However, validation of these resting-state findings has yet to be performed. In this study, we compared spinal fMRI results with electrophysiology (LFP and spike activity) in non-human primates and found that 1) signals elicited by stimulation occur predominantly in the ipsilateral dorsal horn and only in the appropriate segments 2) resting-state dorsal-dorsal functional connectivity is significantly greater than that in dorsal-to-intermediate-gray-matter, and 3) resting-state functional connectivity is spatially constrained to two spinal segments. 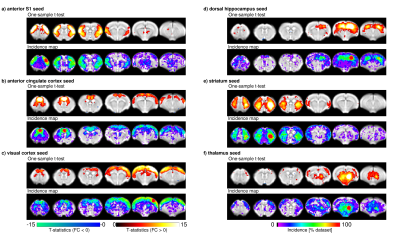 Diffusion fMRI (dfMRI) has been suggested as an alternative means for mapping activity more directly than its BOLD fMRI counterpart. However, it remains unclear whether dfMRI can deliver information not revealed by BOLD. Here, isotropic diffusion encoding dfMRI was used for mapping activity elicited by electrical forepaw stimulation. Data-driven analysis revealed that active voxels are localized within functionally distinct cortical units in dfMRI, while BOLD maps only evidenced widespread signals in the primary somatosensory cortex. 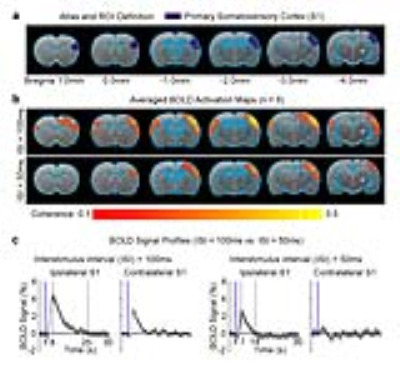 Furthermore, dfMRI extracted the expected thalamocortical brain circuitry whereas BOLD fMRI did not, suggesting a potential role for dfMRI in direct detection of activity. Animals perceive their olfactory environment not only from odors originating in the external world (orthonasal route), but also from odors released in the oral cavity while eating food (retronasal route). We delivered odorants via the orthonasal and retronasal routes and measured whole olfactory bulb (OB) glomerular activity responses by fMRI. Our fMRI BOLD activation maps from the whole OB revealed gross spatial activation patterns that are largely independent of stimulus route, except for lower efficacy of retronasal stimuli as compared to orthonasal stimuli. This different encoding likely alters the odor perception for food vs. smelling.